Connor Baxter has won the 2016 Iberdrola Bilbao World SUP Challenge here in the Spanish Basque Country, edging out Starboard team mates Michael Booth and Leo Nika in a frantic sprint to the line that can only be described as intense. After 14kms of high-paced paddling here at Week 5 of the EuroTour, Connor waited right until the end to make his move, edging past Boothy and Leo in the final few hundred metres to claim his second win of this year’s Tour. After a frenetic pace over the opening 500 metres eventually settled down into a rhythm during the middle of the race, the top guys gave it all over the final few kms. Indeed, the pace was so fast out front that the stragglers who were holding on to the back of the lead group were getting dropped one by one — in the end there were just 8 guys in the front train, which had started as a 23-man pack. There was a bit of post-race drama though, with Boothy protesting the tight line that Connor took close to the side of the river over the final hundred metres. The Aussie claimed that Connor boxed him out, Connor said it wasn’t intentional, while the organisers took a very close look but essentially concluded it was “rubbing is racing” and that the Hawaiian’s win stands. But while there were some heated words exchanged post-race, what happens on the water will stay on the water – these boys have been traveling together the past couple of weeks ans will continue doing so over the next two – but there’s certainly a very interesting rivalry growing here, especially seeing how they’re actually team mates. Boothy and Connor have now shared first and second at all three EuroTour “Headline” events over the past couple of weeks (St. Maxime, the Lost Mills and now here in Bilbao), and with a bit of spice added to today’s race, it’ll be very interesting to watch next weekend when they go head-to-head again for Week 6 in San Sebastian. 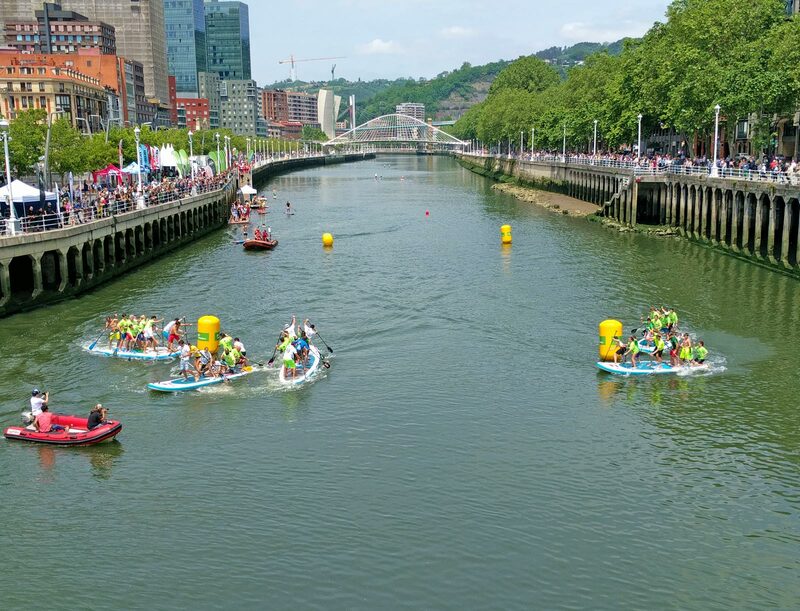 Wow, what a race it was here in Bilbao today… Full results coming soon, thanks to 📷@freight_s for the quick share of this awesome angle! But let’s not let that one incident overshadow what was an absolutely amazing race. After the top three, it was a photo finish between Mo, Jake and Trevor Tunnington. After reviewing the photos and videos, it was still nearly impossible to separate Mo and Jake, however the judges call gave Mo 4th by a bee’s nose, with Jake 5th and Trevor officially 6th. All three of these guys had looked good during the race, and it’s rather cruel (but also rather exciting) that it came down to such a close call, especially seeing how Trevor missed out on a spot inside the money by around four-tenths of a second. It’s good to see Jake back in form, having shown top pace at both the Lost Mills and here in Bilbao following his DNF in St. Maxime a couple of weeks ago. For Mo it was a great rebound result after he started throwing up on the final lap of the Lost Mills race last weekend (which sent him tumbling outside the top 30 in that event). Indeed, Mo could have had a shocker again here today after he fell in right when the starting horn blew, but despite looking like a drowned rat for most of the race, the Focus/Quickblade team rider regained his composure and surged back through the field to help set the early pace. Though it was a heartbreaking end for defending champ Titouan Puyo (NSP/Quickblade), who helped set the pace all day and looked in prime position to go for the win over the final km, only to be caught up in the hectic push around the final buoy, which sent him tumbling in for a swim and killed his chances. That left the Starboard trio of Connor, Boothy and Leo in the clear for the sprint home, with Titou limping across the line in 7th, still smiling as always but no doubt devastated to have been so close yet so far. The Hasulyo Brothers, Bruno and Daniel, were impressive again in both finishing top 10. These two have quickly become permanent fixtures on the international race scene and seem to grow stronger every week. Arthur Arutkin looked good early but faded late, while Jeremy Teulade, Beau O’Brian, Davide Ionico, Martin Letourneur and Giordano Capparella weren’t far behind and fought hard for the minor spots in the top 15. It was yet another huge result for Team Starboard here in Europe, with the orange-tipped blue boards claiming a mammoth eight of the top twelve spots. On the women’s side, Fiona Wylde from Team Starboard led early and looked in control for much of the race, however Mistral’s Seychelle Hattingh fought hard to slowly but surely close the gap and send the result all the way to the line. After a 500 metre sprint from the final buoy to the finish, Seychelle out-muscled her young compatriot to claim her maiden EuroTour win by a couple of board lengths. Seychelle has gone from strength-to-strength over the past 12 months, taking out the 11 City Tour in Holland and setting the 24 hour world record in December. Look out for this girl, particularly in the distance races that she clearly loves. Behind the lead duo, Spain’s Laura Quetglas (SIC) and North Carolina’s April Zilg (Hobie) battled all the way to the line, with the Spaniard taking the win after April got tangled with one of the back-marker men going around the final buoy. 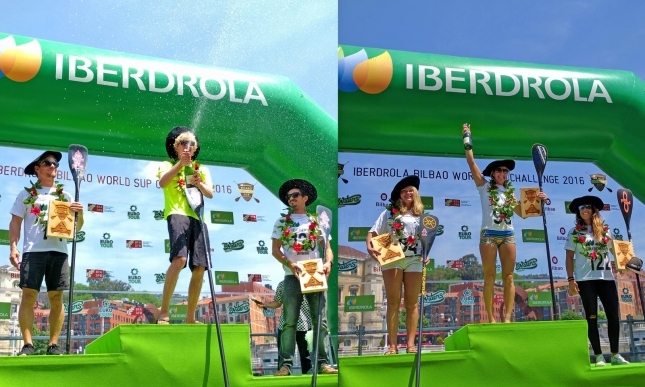 It was also an impressive effort from young Spanish prospect Cyara Palenzuela, who outlasted Kim Barnes and Lexi Alston to claim a top five finish. Congratulations to Kyla Shoemaker from Florida – the winner of this week’s VMG Blades predictions contest and the proud new owner of an elite carbon race fin. And congrats also to Jonathan Roberts, who won our mid-race trivia contest and picked up one of the new VMG “Dragon Grip” paddle wraps. We’ll try and find some internet stable for the race in San Sebastian next weekend (Week 6 of the EuroTour), and if we do we’ll run another predictions contest, so check out the VMG Blades site to see what you could potentially win. Huge thanks to Starboard, VMG and the EuroTour crew for supporting us over here in Europe and making these live streams possible. Huge thanks to the team from BWaters for looking after us and once again running a world class event, and a big shout out to the EuroTour crew for continuing to unite the racing scene in Europe. With the serious racing over for today, the guys and girls can unwind and enjoy themselves tonight, with tomorrow simply being a Sunday Fun Day (featuring the awesome Red Paddle Co. giant inflatable SUP showdown). We’ll update the full results on Sunday morning. In the meantime, there are plenty of photos from today up on the official EuroTour dropbox. 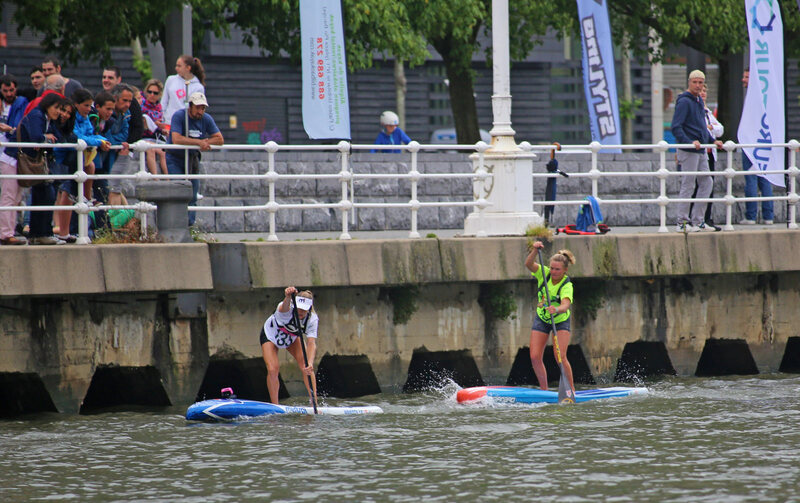 SUNDAY EVENING UPDATE: Both the EuroTour Leaderboard and the SUP Racer World Rankings have been updated with results from Bilbao. Oh and here’s a bonus shot from the Sunday Funday; The Red Paddle Co Big SUP Inflatable Sprint Super Showdown — definitely the funnest part of the weekend! After an overcast day on Saturday, it was a beautiful sunny day (super hot) here in Bilbao to finish off the event, with a huge crowd gathered to watch the carnage and entertainment of the eight-paddlers-per-board inflatable race. Results below are only from the Elite Divisions. There were 137 total paddlers on the start line — click here for results from the open, amateur and junior divisions. 19 Branislav Sramek 1:30:24.00 3.60 JP Australia Czech Rep.
25 Alan Fernandes 1:34:56.60 2.20 ? ? 26 Daniel Parres Puerto 1:36:11.13 2.08 ? ? 27 Aritz Tena 1:37:01.22 1.96 ? ? 28 Jano Rodrigues 1:37:13.47 1.84 ? ? 9 Virginie Louppe 2:20:20.45 6.75 France ?